-Seen It- Bodies start turning up around the city, as we watch a set of confess-or-die torture games gets underway in a countryside warehouse. Two detectives start to suspect a female coroner with a Jigsaw obsession. Are they dealing with a copycat, or is Jigsaw himself still alive?… Seven years after the franchise seemingly wrapped up comes this soft reboot from two pedigree filmmakers. Indeed this is a good Saw film for 70 minutes, the setup is intriguing and it delivers on what you’d expect – but then it finally has to show its hand. The problem is the previous films have written this series into a corner. Here it needed a full reset. Instead the desire to include Tobin Bell (in a capacity I won’t spoil here) just doesn’t make physical sense and the elaborateness/motivation of the killer doesn’t convince. The Spierig Brothers (‘Daybreakers’, ‘Predestination’) are great genre filmmakers, but with no story room, fresh concept or personal stamp they must have made this for the money. The series should have ended after the 4th, but if you’ve watched this far then ‘Jigsaw’ will deliver more of what you’ve been enjoying. -Seen It- When a cop (Poole) happens upon a blood-soaked figure limping down a deserted stretch of road, he rushes the young man to a nearby hospital staffed by a skeleton crew. Soon hooded cult members have surrounded it, and patients and personnel are transforming into something inhuman. 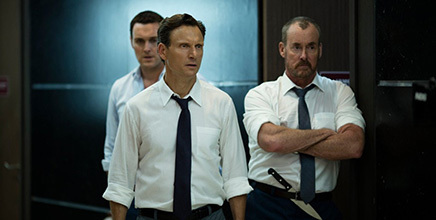 He’ll have to lead the survivors on a hellish voyage into the subterranean depths of the hospital to try and end this nightmare… The writer-director duo did fx on the likes of ‘Pacific Rim’ and TV’s ‘Hannibal’ and turned to Indiegogo to fund ‘The Void’s’ all-practical creatures. The result is an effectively made Carpenter-inspired Lovecraftian siege horror (think ‘Prince of Darkness’ meets Fulci), complete with solid performances and unsettling atmospherics. It almost makes the case for a return to practical monster fx, though the creature designs ought to have shrugged off past influences (‘The Thing’, ‘The Fly’, ‘Hellraiser’ etc) to present something more memorably unique. -Seen It- Supernatural horror-thriller based on the popular manga series. Light Turner (Wolff, ‘Paper Towns’), a bright student, stumbles across a mystical notebook that has the power to kill any person whose name he writes in it – overseen by its malevolent creator Ryuk (Dafoe), a demonic god of death. Light decides to launch a secret vigilante crusade to rid the streets of criminals, allying with his attractive classmate Mia (Qualley, ‘The Nice Guys’). Soon he finds himself pursued by a skilled detective (Stanfield, ‘Get Out’) known only by the alias L, who’s determined to end his reign of terror and who fears the intoxication Light has with his new godlike serial killing ability… Director Adam Wingard made the excellent ‘The Guest’ and ‘You’re Next’, and certainly doesn’t shy from a fan-wrath challenge having also helmed 2016 sequel/reboot ‘Blair Witch’. The budget for this Netflix-produced movie is reportedly a high $40-50 million. It’s well directed, with solid cinematography, score and feels like a proper theatrical movie rather than a Netflix original. Hollywood has struggled to successfully adapt Japanese mangas given how culturally specific, lengthy and visually intense they are and, as with ‘Dragonball Evolution’ and ‘Ghost in the Shell’, there have been accusations of whitewashing, before the inevitable cries of story dilution. Here the 12-volume manga comic / 37-episode TV series is being squeezed into 2 hours. But some of the questionable changes were not time-dictated. Light’s constant companion in the original was Ryuk, who was often as sad a figure as he was sinister, but the addition of a girlfriend character here sidelines that interesting relationship, making Ryuk simply a cackling villain. Meanwhile Light’s morally corrupt actions in the manga meant audience sympathy often shifted back and forth to L, an intreguing dynamic. But here the questionable death decisions are made by someone else, leaving Light a good guy throughout. The introduction of L doesn’t translate well, now he’s an over-the-top quirky American rather than Japanese elusive, but the performance settles as time goes on. Long time fans invested in the lore will bemoan changes like these, with justification, but those new to it, or more casual, will find something to enjoy. Judged on its own merits this is still a solid, well-made horror based on an interesting premise. In a dark social experiment, a group of eighty Americans are locked in their high-rise corporate office in Colombia and ordered by a voice from the intercom to play a deadly game – kill three coworkers each, or the company will kill six… It’s ‘Battle Royale’ with a slight tweak to the rules and participants. But ‘Belko’ should prove a more satisfying and adult version than ‘Hunger Games’. From the director of the solid ‘Wolf Creek’ movies and flop ‘The Darkness’, it’s written and co-produced by James Gunn. His career high with ‘Guardians of the Galaxy’ has got this long-gestating project off the ground. Gunn is a terrific writer of the farcically-underpinned, having been born out the Troma school, with much of his stuff achieving a cult status (see ‘Slither’). Expect ‘Belko’ to open soft but find that same audience later, especially when some of its more out-there gory scenes hit YouTube. -Seen It- Couples on the colony ship Covenant (inc Waterston, Crudup, McBride) track a mysterious signal to the home planet of The Engineers, ancient pre-humans. There they encounter megalomaniac android David (Fassbender) from the doomed Prometheus, also his deadly alien prototypes, and learn the fate of his companion Shaw… Ridley Scott’s second swing at a prequel has good atmosphere, some beautiful vistas, and decent performances from the likes of Danny McBride. 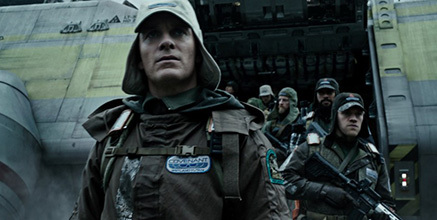 None of it is fresh however, it’s almost a ‘Prometheus’ remake – instead of following David and Shaw, which would have been more original, it’s yet another ship, another crew, another distress call, landing on another planet to be infected and picked off. Given Ridley has a reputation as a great “world builder”, the engineer homeworld is extremely underdeveloped. An Alien prequel shouldn’t be answering who created the aliens (or human beings), the fear of the first two films came from it being a random encounter with a deep space creature. Instead it ought to be showing their natural habitat and expanding the otherwordly biology. Making them the creation of a rogue android just demystifies them and doesn’t feel legit (not to mention the pretentious silliness of David kissing himself, playing the flute, and prompting a baby alien to do jazz hands). But while the ideas behind ‘Covenant’ let it down, the money is there on screen and it’s still entertaining in a brain-off way. The protomorph sequences are the highlight. They’re effectively creepy and both the back-bursting scene and the gory grasslands scene are pretty memorable. There are some great touches too, like how Walter “folds” when he is attacked. ‘Covenant’ exists really as a curiosity, and missed opportunity.